Vicki Keith was a remarkable marathon swimmer who became the first person to swim all of the Great Lakes in September 1988. She is the most successful marathon swimmer in the history of the sport, with 16 world records. Keith moved with her family to Ottawa from Winnipeg at an early age. She discovered swimming and began to train for marathons in 1984. Within a few months, she set her first two world records – in the 19-kilometre butterfly and the 100-hour continuous swim. 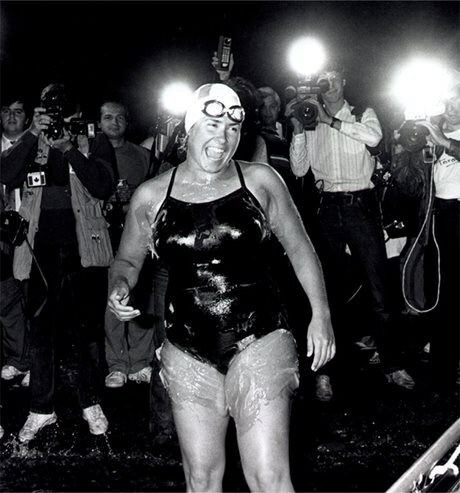 In 1986, she swam for a world record time of 129 hours and 45 minutes. The following year, she completed the first double crossing of Lake Ontario. Keith also swam the English Channel, Sydney Harbour and the Strait of Juan de Fuca. After retiring from marathon swimming, Keith started a swimming team in Kingston for youth with physical disabilities. Visit the Penguins Can Fly website to learn more about Vicki Keith and the Kingston YCMA Aquatic Club. Read more about Vicki Keith on this Ontario Aquatic Hall of Fame biography.